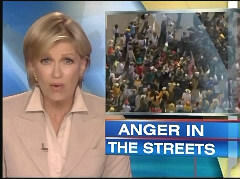 Demonstrations started at dawn – hundreds of protesters, dozens of arrests, tempers flaring. Tensions are running high here outside this jail, where protesters have gathered and it's turned into a standoff with sheriff's deputies who are trying to push their way out of the building. Demonstrations were loud, disruptive, but mostly peaceful. “In a matter of minutes, relief replaced dread, hope replaced fear,” ABC's Barbara Pinto trumpeted in framing a Wednesday night look, at reaction to a federal judge's ruling barring implementation of key provisions of Arizona's immigration enforcement laws, around those pleased by it. ABC's "World News" on Sunday caught up to CBS and NBC in fretting about the potential problems caused by illegal immigrants who may be leaving Arizona before the state's new law takes effect on Thursday. Correspondent Barbara Pinto devoted her entire piece to lamenting the possible damage to small businesses whose customers are presumably now leaving the state, but offered less than a sentence to the idea that illegal immigrants are already an expensive burden on state social services. 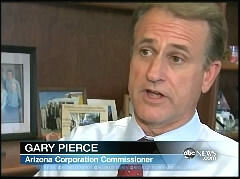 "The loud and bitter battle over Arizona's immigration law has reached fever-pitch," claimed Pinto. "But Rosario Peralta worries about the quiet exodus – immigrant families already leaving the state in droves. In the past few months, she's seen business and customers at her family grocery store disappear." 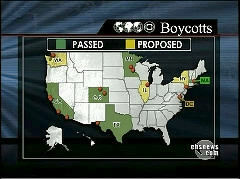 All three broadcast evening newscasts have repeatedly touted, as if it is a valid representation of national sentiment, the “boycott” of Arizona by liberal municipalities such as San Francisco and Los Angeles. But when the Arizona Corporation Commissioner on Tuesday made a tongue-in-cheek offer to help Los Angeles out in its boycott by shutting off the electricity flow, CBS and NBC were silent. JAKE TAPPER: The debate is intense. The Los Angeles City Council voted last month to boycott all official business in Arizona, prompting an Arizona utilities commissioner to all but threaten to cut off the electricity Arizona power plants provide L.A.
GARY PIERCE, ARIZONA CORPORATION COMMISSIONER: You can’t call a boycott on the candy store, and then decide to go in and pick and choose candy you really do want. The night after two major national polls confirmed overwhelming majorities support Arizona's impending immigration enforcement statute (59 percent per Pew and 64 percent per NBC/WSJ), CBS and ABC promoted the cause of activists in the minority. Both devoted full stories to the “uproar” and “emotional civil war” over the law and moves by a few liberal local government bodies to enact boycotts, only getting late in their stories to those who like the law. The Thursday night stories were pegged to a boycott vote by the Democratic city council of Los Angeles, but CBS's Bill Whitaker and ABC's Barbara Pinto both also played a three-day old clip of California Governor Arnold Schwarzenegger mocking Arizona and pointed to the cancellation of a trip to Arizona by a suburban Chicago high school's girls basketball team – not to deride adults for using teens to grind a political axe, but to illustrate the supposed depth of opposition to Arizona's law. 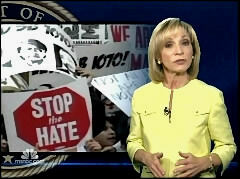 ABC’s Barbara Pinto touted how “the call for an economic boycott here has caught fire on the Internet” while NBC’s Andrea Mitchell trumpeted how “anger over the law has gone viral,” as both pointed to how the American Immigration Lawyers Association had canceled a conference – of a mere 400 attendees -- scheduled for the state. NBC’s Mitchell played clips from two left-wing comedians, as she asserted: “It's now gone beyond protest to threats of a boycott, as Arizona becomes a laughing stock to some.” Viewers then heard a joke from Saturday Night Live about “fascism” followed by The Daily Show’s Jon Stewart: “It's not unprecedented, having to carry around your papers. It's the same thing free black people had to do in 1863.” After showcasing a Facebook page (“Arizona, the Grand Canyon State, welcomes you unless you're a Mexican or look like one”), Mitchell cited “a slap in the face” from Mexico which, ironically, warned its citizens about traveling to Arizona. 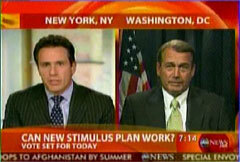 Wednesday’s Good Morning America led into an interview with House Republican Leader John Boehner about the massive Democratic “stimulus” package with a deluge of horror stories about the awful economy: an elderly man who froze to death after failing to pay his power bills; a new report declaring the need for $2 trillion in new infrastructure spending; and an unemployed man who killed his family and himself. But the economic horror stories that ABC pushed prior to showing the interview with Boehner (taped Tuesday afternoon) all contain significant omissions. The “unregulated” power company being blamed for the elderly man’s death is owned by the local government, not some greedy capitalist utility. The new report arguing for massive spending on roads and bridges was released two months early to influence the stimulus vote. And the man who tragically killed his family did not lose his job because of cost-cutting or anything related to the economy, but after being investigated for possible fraud. Housing, oil and inflation were all common themes during the broadcasts of last night’s “CBS Evening News” and “NBC Nightly News.” But, unless you watched last night’s ABC “World News with Charles Gibson” instead of the other two, you would not have known about the positive GDP growth the U.S. Commerce Department reported yesterday.